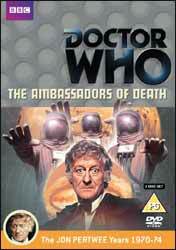 The Ambassadors of Death was the third story in Jon Pertwee’s first season and was the first to use HAVOK, a new company of stunt men who specialised in dangerous stunt work. The seven episode story was originally broadcast between 21 March and 02 May 1970. The show was directed by Michael Ferguson from a script by David Whitaker, Trevor Ray and Michael Hulke. The heavy inclusion of UNIT and the preponderance of military hardware signalled a change in the show's direction and gave a flavour to the show which would be repeated over the coming three seasons, with UNIT becoming an integral part of the show. The story is a bit of a hodgepodge, probably reflecting the number of fingers which eventually were dipped into the writing pie. On the one hand we have a high action concept which is interspersed with a very talky science fiction story. The story also meanders at times with the inclusion of characters and subplots which do little apart from extending the stories overall length. When UNIT first attack the warehouse, from which the alien message has been answered, we are introduced to General Charles Carrington, the main villain of the piece, who removes the ambassadors when Recovery 7 returns to earth - so I’m not sure why they felt that having been kidnapped by a member of the government, they should be further kidnapped by a petty criminal. Even though his inclusion is finally explained it still feels like a touch of filler. Overall, the show works well and the acting quality from Pertwee (The Doctor), Caroline John (Liz Shaw) and Nicholas Courtney (Lethbridge-Stewart) never dips. Sadly all three of the principle actors have passed away, so the latter twos contributions are all the more poignant. There are some very clever directorial choices. Normally Doctor Who would not break the forth wall, but in an effort to bring the story some air of credibility the initial shots of the Mars Probe rescue is presented by a news reader looking straight out at the audience before the camera pulls back to reveal the same shot on the television screen in the Doctor's laboratory. It’s an effective way of getting the audience to become engaged in the story, as in an odd way you, the audience, are watching events unfurl in the same manner as the Doctor. The show has a clear mono audio track with the option for a full length commentary by Caroline John, Nicholas Cortney, Peter Halliday, Geoffrey Beevers, Michael Ferguson, Terrence Dicks, David Ware, Roy Scammell and Derek Martin. The production text is also provided. All seven episodes come with optional subtitles. Although they have succeeded in producing colour versions of all the episodes the variability of the source material means that the finished picture is also variable. That said, the quality never dips below watchable. The worst effect is noticeable colour bleed. The majority of the extras are to be found on the second DVD. Mars Probe 7: Making the Ambassadors of Death (25 min, 52 sec) opens with the accident aboard Apollo 13 as coincidently at the same time as NASA was fighting to save Apollo 13; UNIT was also fighting to save the Mars Probe 7 on the small screen. There are contributions by Terrence Dicks, Michael Ferguson (Director), Derek Ware (HAVOK), Roy Scammell (HAVOK), Margot Hayhoe (Assistance floor manager). The focus of documentary is heavily directed towards HAVOKs work on the show. The Trailer (1 min, 29 sec) for the show is included. Tomorrows Times - The Third Doctor (13 min, 08 sec) is presented by Peter Purves who, given that he works as a presenter, is the natural selection for the job. The piece takes a dip into how the show was perceived by the national press. There is also a photo gallery, the usual Radio Times PDF materials and a Coming Soon (1 min, 05 sec) for The Claws of Axos.